Stand in Mountain pose, hands to heart’s center, feet planted on the Earth. Wiggle your toes, feeling the grass and the warmth or coolness of the Earth. 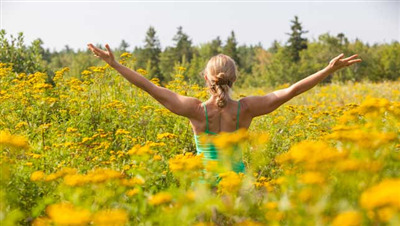 Feel the Earth’s energy be absorbed throughout your body, as you breathe deeply. Listen to the sounds around you, the birds, the wind and feel the air touching your skin. As your palms press against each other, breathe and focus in on how your body and mind feel after spending this time in nature, moving your body and sharing gratitude for Mother Earth. Focus in on an intention for how every day can be Earth Day. One of the first songs we teach to babies about their bodies is, “Head, Shoulders, Knees and Toes, Knees and Toes…” Why? Because babies are fascinated with their bodies and love exploring what they can do! Yoga gives us the opportunity to re-visit that sense of discovery and wonderment. Try practicing Tadasana (Mountain Pose) every day to remind yourself of the awesomeness your body provides you. Can you spread your toes? Can you shift your ankles so they are upright, allowing you to balance your weight evenly? Can you feel your joints stretching and releasing tension in your arms, wrists and hands? You track how many steps you take, jot down how many reps and sets you did, and note how deeply you stretched, but what about monitoring your breath? Ensuring you’re getting the most out of your workout is not just about what’s on your Fitbit. How you breathe between your movement matters! Studies have shown that practicing proper breathing can improve your fitness performance by as much as 15 percent. While breathing is an autonomic bodily function – one that does not require thought – it should be a conscious thought and effort, while practicing yoga and really any exercise for that matter. When practicing yoga, it is important for your movements to be guided by your breathing and not the other way around. You may notice that when you completely submerge yourself into a pose, pushing to achieve a peak goal, you may lose your breath or even hold your breath. It is at that very moment that you break your pose. You think to yourself, “Aaah! I was doing so well and I blew it.” That’s okay. Before attempting any pose, try taking some inventory on your breath before you begin. This is especially important for beginners. 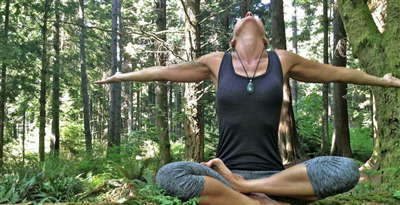 Practice yogic breathing without the postures. Develop an idea of what is good for you. When you’re ready, inhale through your nose for one or two seconds, then slowly raise your arms above your head on the inhale. When you reach the end of the inhalation, pause, then slowly exhale for one to two minutes as you bring your arms down to your sides. This is the best way to take inventory on how you feel. Do you know when and why your breath is shallow, or what makes it speed up? Learning to control your breath through deep awareness, not only improves focus and concentration, but also has been shown to lower blood pressure. You will learn as you practice when to inhale and when to exhale to optimize your experience. For instance, we inhale when lifting or opening our chests and exhale when we fold or twist. We create space in our bodies for the air to fill when we inhale and cleanse that space through our breath’s detoxifying exhale. This is how we get that oxygen-rich blood to flow! Yogic breathing teaches us how to most effectively use oxygen to improve endurance, because the body uses oxygen to produce energy. By focusing on your breath, you are conditioning your lungs and respiratory system for sports and all other forms of exercise. Combining breath with movement can be tricky, but it is pertinent in extending the life of your energy source. Give Your Workout a Mental Boost! No matter what you do for exercise - spinning, kick-boxing, or CrossFit - add in some yoga for a mental boost! Incorporating yoga into your workout routine can totally benefit your mental health. Research has found that people performed better—both speed-wise and accuracy-wise—on brain functioning tests after practicing 20 minutes of yoga. When practiced together, the connection between mind and body, improves overall fitness and wellbeing. 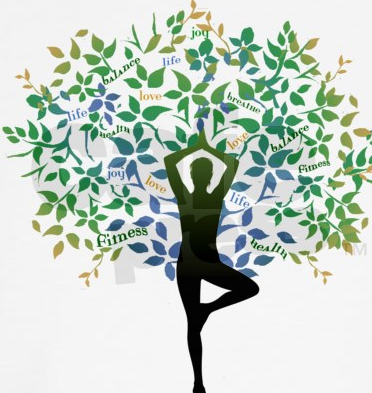 Yoga increases body awareness, relieves stress, reduces muscle tension, strain, and inflammation, sharpens attention and concentration, and calms and centers the nervous system. Yoga's positive benefits on mental health have made it an important practice tool of psychotherapy (American Psychological Association). Adding yoga to your workouts helps improve functional mobility and sharpens the mind to enhance performance. This prevents injury and prolongs the lifespan of activity. Try yoga as you begin any workout. It get your blood flowing and rids the body of toxins. So, you say you're not flexible? I hear that a lot. I’ve found it to be the most common reason why people are hesitant to try yoga. When I attended my first yoga class I could not touch my knees with my hands. I WAS NOT FLEXIBLE. There’s a saying in yoga that you are considered a beginner for the first 10 years of your practice. And what a blissful experience it was and continues to be. Many factors can contribute to a less-than-bendy body, from genetics to the weather outside. Age and gender also play a role, as men and older people tend to be less flexible than the young and females. But that doesn't mean you should rule out yoga. Yoga will help you feel calmer, sleep better, and yes, get more flexible. Yoga isn’t about performing that ‘textbook perfect’ pose. Every single person has their completely unique challenges and they are on their own journey. Yoga is more about this process of unwinding and participating in your journey. Yoga is also not just about flexibility. It’s about flexibility, strength and balance and creating a calm, cool collective expression while practicing. In yoga, we talk about practicing santosha, which is the idea of letting go of expectations and preconceived ideas about how things should be. A yoga class can be intimidating for a first timer, but this idea that we need to be able to wrap our bodies up like pretzels on the first go is setting yourself up for disappointment. Instead, see if you can cultivate a sense of passive acceptance to what is happening in each moment. Don't worry about what happens in the middle of class or the end of class or even next week's class. Stay present and fully aware in each moment and you will reap the benefits tenfold. But one thing is for sure, if you keep avoiding yoga because you’re not flexible enough… then when will you be flexible enough to do it? Spring is literally around the corner, but you’re growing impatient. You’ve had your fill of snow and cold and are ready for some CHANGE. It’s too early to ditch your warm coat, but there are a few yoga poses that just might help you during the grueling, final stretch of winter. Dancer pose, Triangle pose, and Camel pose – all great postures that energize your body. All act as natural stimulants to set you up for a productive day. They warm up the body and bring you from repose to refresh. Many of us sleep with the spine and hips rounded in fetal position, which is calming and introspective for rest and contemplation. In contrast, backbends stretch and extend the spine and hips and bring an energetic openness to the body, preparing you for action. Take 10, 20, or 30 minutes every morning to practice, and you’ll start your day wide-awake and full of life. Side Plank, Sun Salutations, Bridge pose, and Bow pose are all great postures that generate heat. And this is what we crave this time of year for sure! By holding these postures, you will generate heat, build strength, and train your ability to focus and find stillness. Heart opening postures – Cobra pose, Cat pose, Wheel pose. These poses help with anxiety and depression. It is easy to fall into a slump towards the end of winter-time… maybe you’ve gotton off the track from the intentions you set for the new year. Heart opening postures are perfect for getting back to yourself. They warm the spine and stimulate the heart chakra, which is responsible for our ability to give and receive love. rather than receiving an imprint from existence. In yoga, we talk about letting go of what no longer serves us. This can be said of anything or anyone who weighs us down physically, mentally, emotionally, or spiritually. It refers to our attachment to certainties in life. It can manifest itself in behaviors that leave us feeling unfulfilled or anxious. It is trying to live up to expectations and desires that invariably leave us with a compromised sense of self. Like anything that is unwanted – extra body weight, a toxic relationship, a career that no longer serves our best interest – it can be difficult to shed. Part of the goals behind meditation is to not have to let go, later, of what has become a burden, but rather to not hold on to it in the first place. "Quiet the mind, and the soul will speak." Life can get hectic at times, as there are many things that are out of our control. Meditation is a simple, yet very effective way of calming our minds and changing them for the better. By developing a meditation practice, you will learn the habits of your mind as a means to cultivate a more positive way of being. 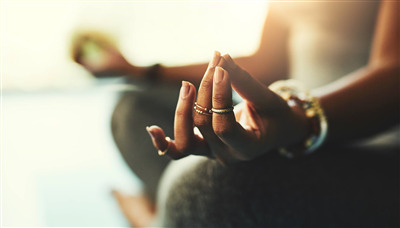 Join Lauren for a workshop to understand the tools to begin a meditation practice. Gain concentration, emotional positivity, and tranquility from within amidst the chaos of day-to-day life. · Wear light, comfortable clothing. · Avoid eating at least one hour before and drink lots of water afterwards. · Bring mat and water.